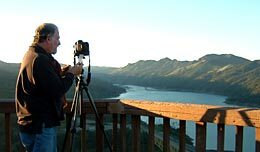 Have a look at some of the photos we have taken of the Russian River area. [above] Louis Jawitz takes photos for his New York based stock photography company. The setting is Lake Sonoma at dusk as seen from the Overlook.